It’s no secret that United has invested a great deal of time and money into its new Polaris business class offering. 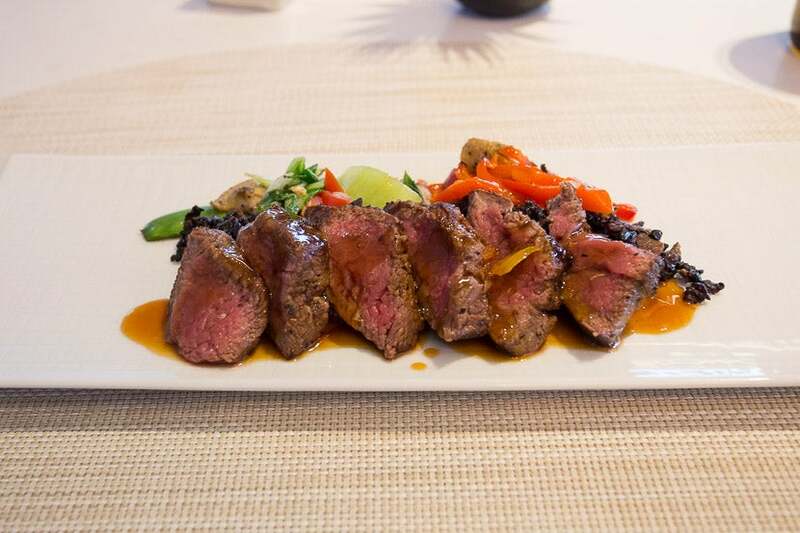 Earlier this week, the airline started its a la carte dining option at Chicago O’Hare Airport. While TPG Editor-in-Chief Zach Honig already reviewed the United Polaris Lounge at ORD, I had a chance today to stop by and try out the new food options. Spoiler alert: It’s all really good! During my visit, I had the opportunity to test out the new breakfast menu, served until 11:00am, and the lunch/dinner menu, served until 30 minutes before closing. That usually means food is available for order until 8:30pm, but the lounge does technically stay open until the last flight of the day leaves, just in case of delays. Today, the staff transitioned from breakfast to lunch between 10:30am and 11:00am, so if you’re looking for breakfast items specifically, I’d suggest placing your order before 10:30am. 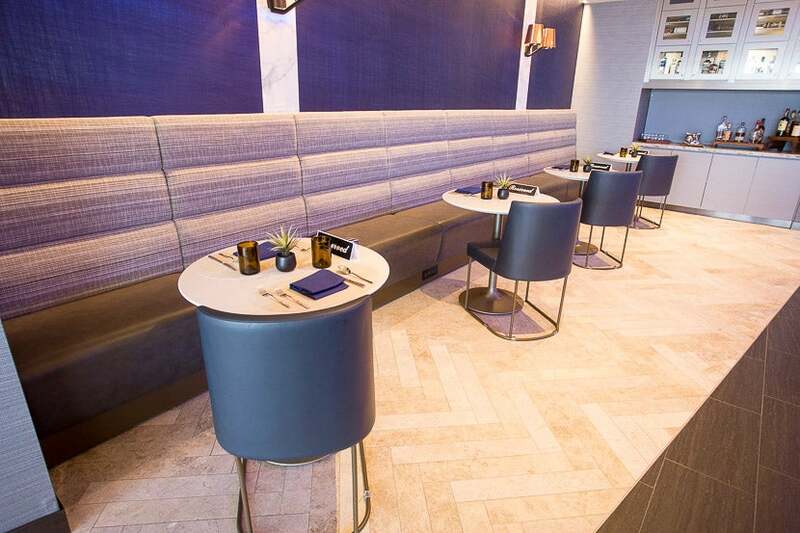 While I didn’t entirely love the new Polaris seats I tested out on the ground recently at an event in Chicago, this new Polaris Lounge makes United Clubs, Admirals Clubs and Delta SkyClubs feel like you’re flying Spirit Airlines. The United Polaris Lounge is a pretty substantial size, considering only business- and first-class passengers (flying United Polaris or in a premium cabin on a partner) have access — no club membership or elite status will get you in here. I love the new individual pods where you can sit and get some work done or just relax. Currently, there are 16 dining tables available, though UA plans to expand that to 24 tables by next week. Each one sports a “Reserved” sign, but fear not — they are open to anyone. According to the staff, the reserved sign is just to make it clear that these tables are saved for a la carte dining, and guests are discouraged from sitting there otherwise. Don’t worry about the “Reserved” signage — it’s only there to ensure that the tables are used for dining only, and not simply as regular seating. During my visit, the tables were never completely occupied, but in the event that they are, the lounge “concierges” will open a waitlist, much like at a traditional restaurant, and find you in the lounge when a table is ready. 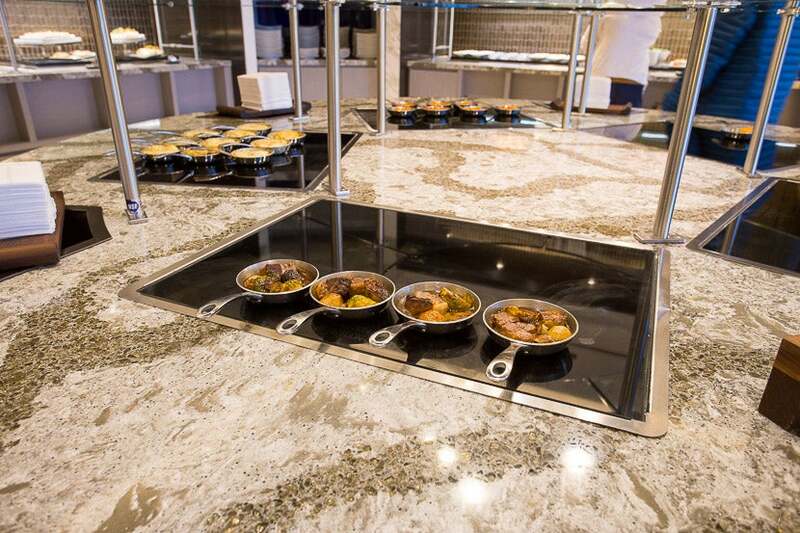 There’s also a great buffet, with novel little skillet plates for the taking. Guests are welcome to enjoy their buffet options at the individual pods or elsewhere in the lounge, but you can’t do the a la carte dining outside the dining tables area. I do prefer it this way, as it truly feels more like a restaurant with attentive table service, rather than just ordering food at a lounge. 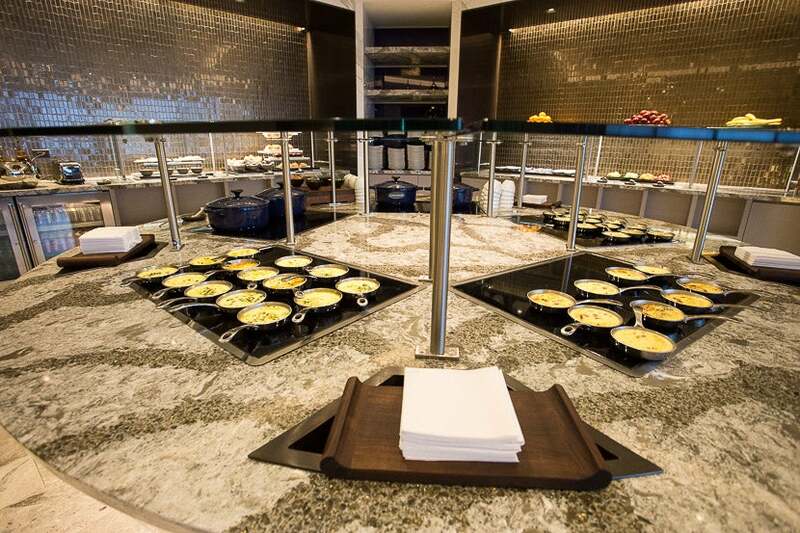 There’s also a buffet selection with novel little skillet dishes if you want something quick. One thing to note — the lounge is definitely set up for people traveling solo, or with one companion. All the dining seats so far are for one or two people, and most of the seats around the lounge are either individual pods or a pair of chairs. This makes sense for an international business- and first-class lounge that you can’t access with elite status or bring guests into (except for passengers in Polaris first, and even then, only one guest anyway). If you do happen to have an entire family flying with you in business class, you’ll likely have to ask the staff to try to awkwardly merge the rounded tables together if you want to sit together. But for the majority of cases, this setup makes a lot of sense, promotes privacy when traveling for business and makes the lounge feel far more comfortable. 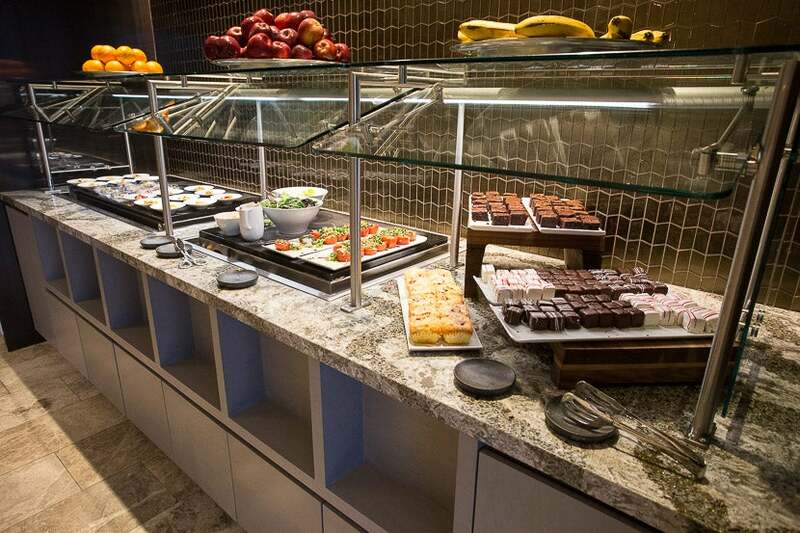 There’s also a buffet set up in a separate area of the lounge, which you are obviously welcome to eat from as well. 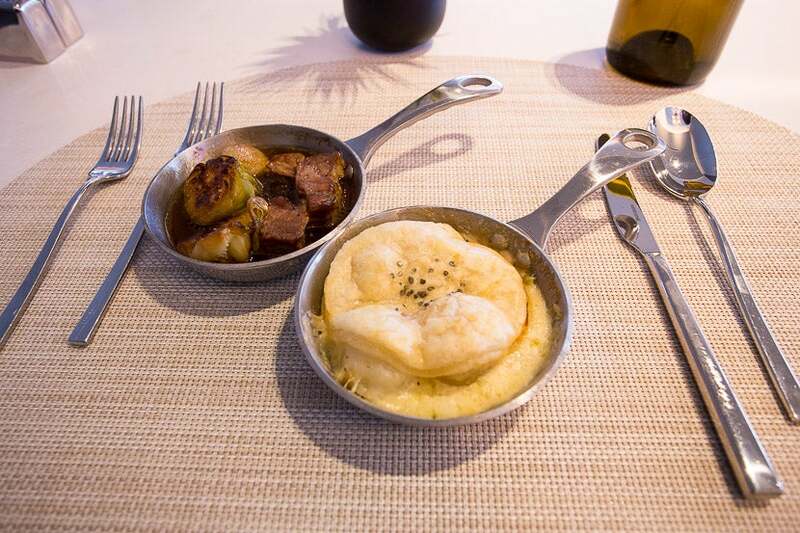 There were really cool dishes served in mini-skillets — frittatas for breakfast and other items for lunch. Sadly, the items weren’t labeled or marked, so I had to ask a lounge attendant each time to figure out what they were. 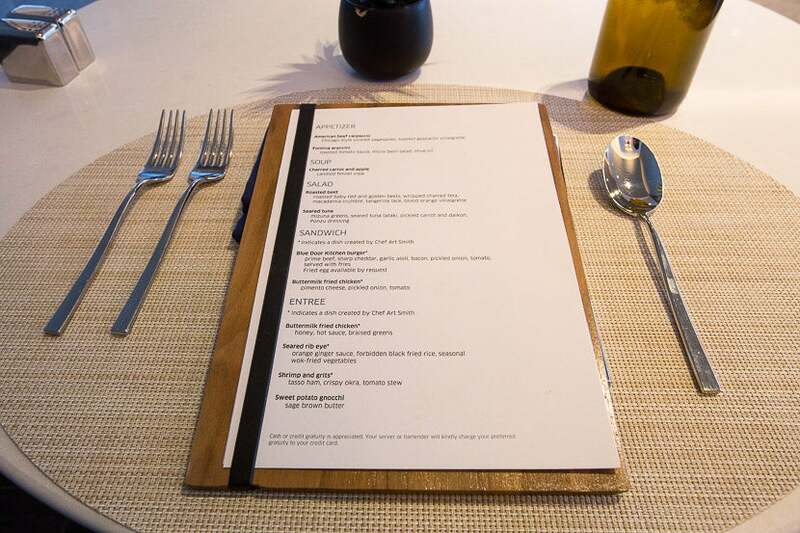 Upon approaching the dining area, I was quickly given a table and menu, then assigned a server — just like in a restaurant. 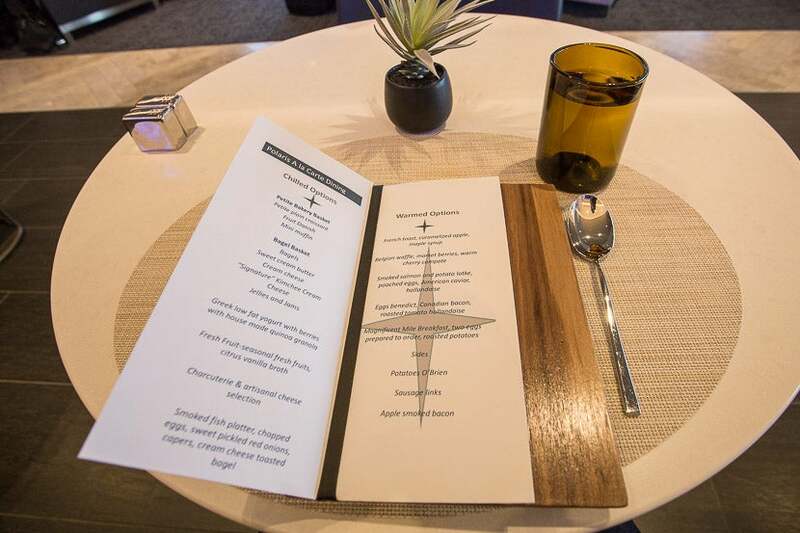 The menu is designed to have smaller portions so that you can try out multiple items if you’d like, or save room for the in-flight meal. Personally, on Europe-bound evening flights, I tend to like to eat in the lounge so I can get as much sleep as possible on the short hop across the Atlantic. United’s delicious breakfast selection at the Chicago Polaris Lounge. Sides of Potatoes O’Brien, sausage links, and apple smoked bacon are available for order as well. The breakfast buffet had three frittata options, as well as two types of porridge, along with sausages and other items. 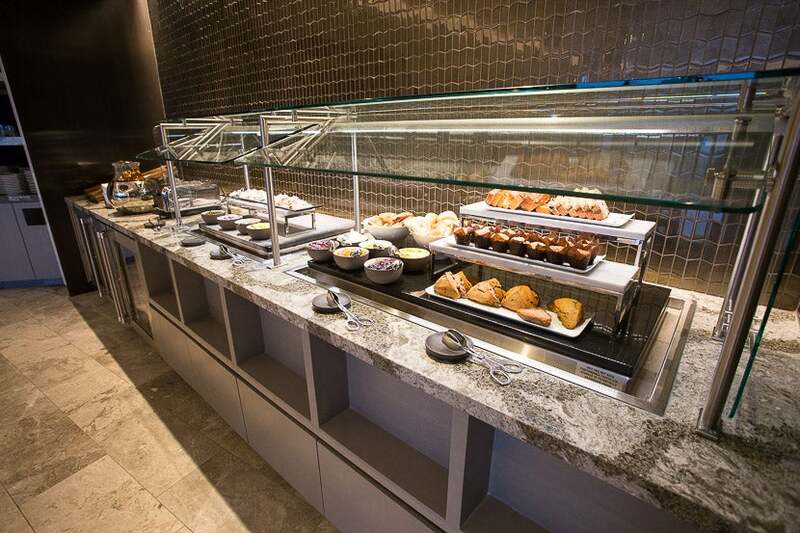 Apart from the sit-down menu, there’s also a sizable buffet selection, with fruit, pastries, two types of porridge and three types of frittatas — vegetable, sausage and bacon, and a cheese option. I tried the sausage bacon frittata, which was alright, but assuming you have enough time, I’d stick to the a la carte menu. There are plenty of pastries to go around in the buffet section. I wanted to try as much of the food as possible, so I ordered an orange juice, Eggs Benedict, smoked salmon and potato latke (with caviar!) 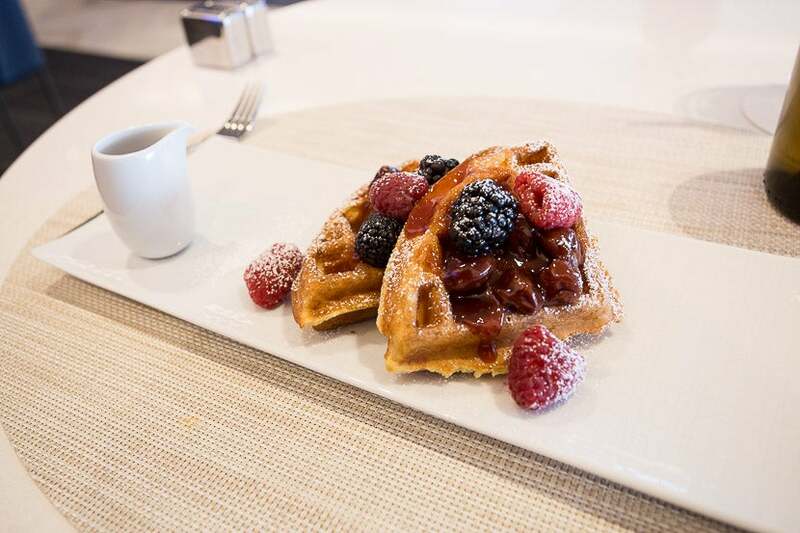 and Belgian waffles. I asked for the Eggs Benedict and smoked salmon dishes together first, which turned out to be a good idea — the smoked salmon and potato latke is essentially an Eggs Benedict, but with smoked salmon instead of ham and a potato latke instead of an English muffin. I ordered the Eggs Benedict and smoked salmon with potato latke and caviar side-by-side — a delicious decision. The eggs were perfectly poached with both dishes, with plenty of delicious, oozing yolk. Both were served with a side of roasted potatoes, and I found the portions to be perfect for the occasion — you can always order more food, but I hate wasting it if there’s too much before you get on a flight. The star here was the caviar on top of the smoked salmon dish. Sure, it’s probably not gourmet caviar, and didn’t come close to what I’d just eaten in Cathay Pacific first class merely hours before, but c’mon, when’s the last time you’ve had caviar in any lounge, domestic or otherwise? The caviar added a perfect balance to the poached egg and hollandaise sauce, with just the right amount of saltiness. The Belgian waffles were delicious as well, though I didn’t care for the cherry compote as much. To finish up the meal, I had a Belgian waffle topped with fruit, cherry compote and powdered sugar with syrup on the side. I didn’t care much for the cherry compote, but the waffles were cooked to just the right amount of crispiness and were otherwise delicious. After the meal, my wonderful server Monique proactively brought over an Illy latte, complete with Polaris logo coffee art on top. I’m not a coffee expert, but it tasted pretty decent. 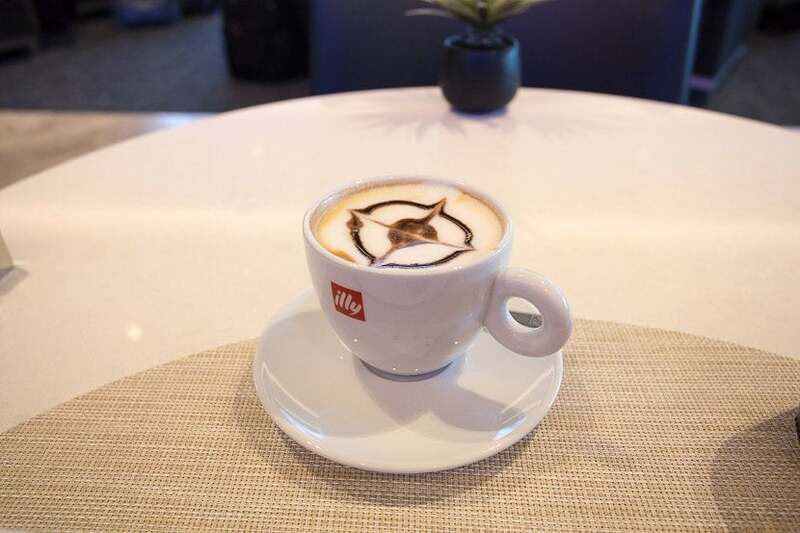 After my meal, I was proactively offered an Illy latte, complete with the Polaris logo. All in all, I’m a guy who usually dislikes breakfast in favor of lunch or dinner. I was pretty impressed by the options offered though, and the smoked salmon and potato latke topped with caviar definitely stole the show — I highly recommend ordering that if you generally like Eggs Benedict. After working in an individual pod for a few hours to let my stomach digest the food, I headed back to the dining area to try out the lunch menu — I wish I had eaten less for breakfast, since the lunch menu was even better. Lunch/dinner service begins at 11:00am, and is available into the evening hours. Here’s what you’ll be able to order for lunch. As with the breakfast menu, many of the options come in small portions so you can try more than one item — note that the entrees are the exception and represent a heartier meal. Some of the dishes, such as the buttermilk chicken and pear and cranberry cobbler, also take a little longer to prepare (about 15 minutes). Your server should let you know more about that, but keep that in mind if you have a flight to catch. Many of the dishes are created by Chef Art Smith, whose claim to fame was a stint serving as Oprah Winfrey’s personal chef. Pear and cranberry cobbler, with macadamia nut crust and red wine caramel sauce. There are salads and cheese on offer in the buffet, if you’d like — but if you have time, definitely take advantage of the sit-down dining option instead. 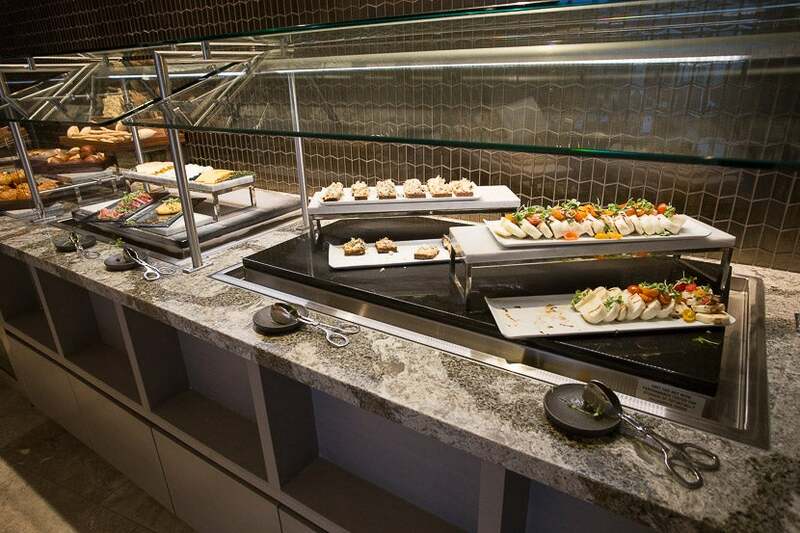 Again, there are a number of buffet options available as well, including cheeses, salads, brownies and mini-cake bites. Among the hot options were a braised short rib, pasta and what looked like a chicken pot pie with puff pastry. The latter turned out to be a mushroom pot pie, devoid of any chicken — a small placard or label would have been quite helpful here. For dessert at the buffet, there were brownies and delicious mini-cakes that reminded me of a cake pop. Among the buffet options, I tried out the braised short rib and the pot pie — the short rib was great, with great flavors and wonderfully cooked Brussels sprouts. I was less impressed with the pot pie — which, again, I would’ve avoided if it had been labeled. As with breakfast, if you have the time, I’d highly recommend skipping the buffet options and going straight to the a la carte menu. I tried the braised short rib and pot pie — both were good, but nothing compared to the a la carte items. Since lunch had been served for an hour or so after I had enough of an appetite, the lounge was abuzz with people talking about the fantastic menu and food, so I was quite excited to try it out. I ordered the beef carpaccio to start, followed by the roasted beet salad, buttermilk fried chicken and seared rib eye (cooked to medium rare, of course). A well-prepared beef carpaccio, which perhaps could’ve used just a tad more seasoning. Let me tell you — each of the dishes I ordered were superb. The lunch menu here isn’t fancy by any means, but with excellent, hearty food. It easily compares to food in top international first-class lounges like Qantas First in LAX, and Cathay Pacific’s The Wing and The Pier first-class lounges in Hong Kong. The beef carpaccio was excellent, though perhaps just a tad under-seasoned to my taste. The beet salad was fantastic, with both red and golden beets and a wonderful feta cheese. 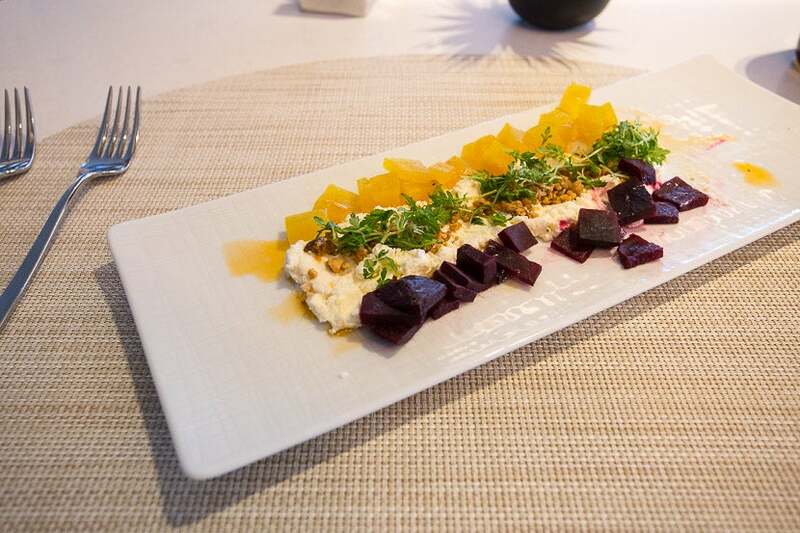 Around me, I heard other passengers raving about the beet salad too, so definitely try it out if you’re a fan of beets. The roasted beet salad is fantastic, and tasted very refreshing with the fried chicken. It was so good that I may have been guilty of tasting it before I remembered to take a photo! Next up were the real stars of the show, the entrees: I had the buttermilk fried chicken first, which was incredible. The chicken was tender and moist, but crispy. Be careful with the hot sauce though — it’s delicious, but spicy! Definitely taste a little first before pouring or dipping your chicken straight into the sauce. 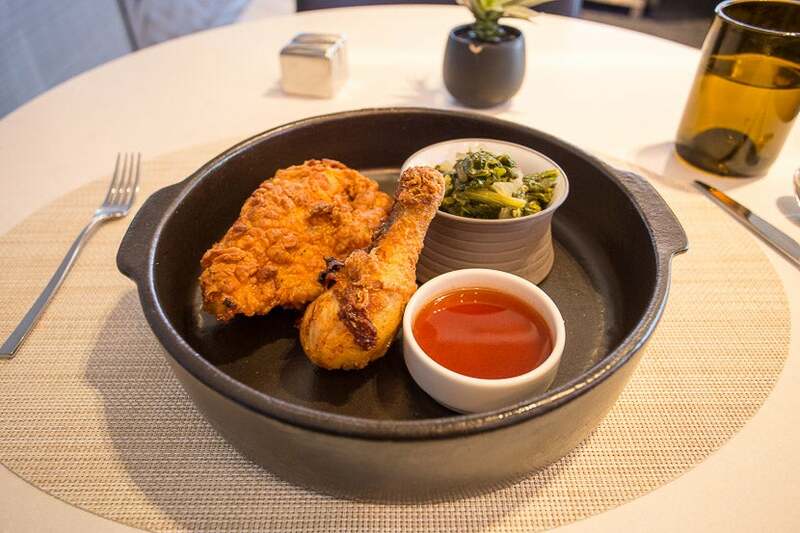 I would definitely order this fried chicken again — it’s the best fried chicken I’ve ever had. I finished up the meal with the seared rib eye, which was cooked to perfection at medium rare. Steak is one thing I try to avoid eating on planes, since reheated partially cooked steak is very difficult to get right with a galley oven. This was definitely a good way to satisfy my appetite for steak. I could’ve done with a little less orange ginger sauce, which tasted like teriyaki, though, and I left the vegetables and rice on the plate. But none of that really matters, since the beef itself was incredible. To finish, I had the seared rib eye, cooked to a perfect medium rare. At that point, I was too full to order dessert, and I don’t have much of a sweet tooth, but there are three options to choose from should you want it. All in all, the lunch/dinner was fantastic. If you find yourself in a Polaris lounge soon, I highly recommend trying the roasted beet salad and the buttermilk fried chicken. I’d also order the seared rib eye again, just for the steak. Food at the Polaris Lounge is great — really great — miles better than any other domestic offering from United’s competitors. American Airlines, for instance, offers limited buffet food options in its “International First Class” lounges. Later this year, those lounges will be branded back to “Flagship Lounges,” and some will offer Flagship Dining to first-class passengers only — keep in mind that Polaris dining is available to all business- and first-class passengers. If you have the time, I’d definitely suggest taking advantage of the a la carte options — they’re much better than the buffet choices, which are already fantastic. 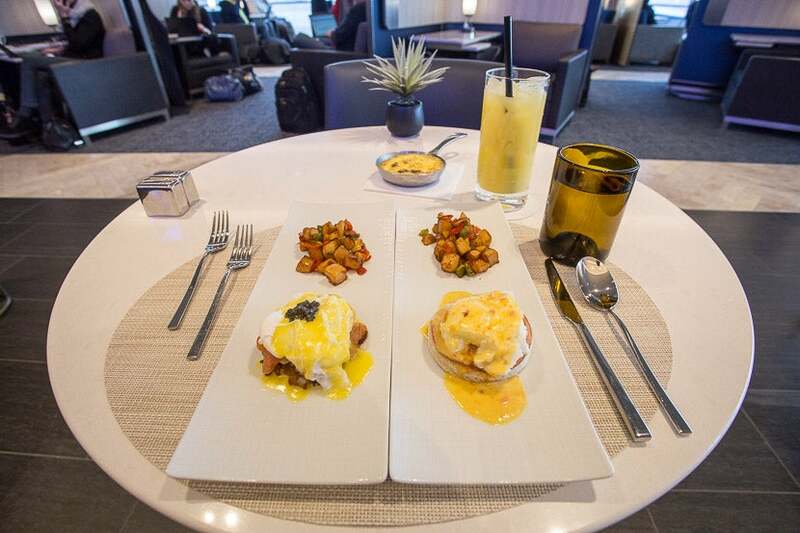 While Delta did offer some a la carte dining options in its JFK Sky Club for premium-cabin passengers some time ago, it no longer offers any sit-down dining options. My server, Monique, was great as well, with service as attentive as the best restaurants. There are at least two servers for just 16 tables of two, of which only five were occupied when I dined, so there’s definitely a feeling of personal attention. One last item of note — the lunch/dinner menu (but not the breakfast menu) solicits cash or credit card tips at the bottom. I found this to be a little strange for a lounge — perhaps others feel differently. During my visit, I didn’t notice anyone leaving cash tips, or approaching the bar to swipe a credit card for tips. Currently, there’s only one Polaris Lounge in operation, and that’s at Chicago’s O’Hare International Airport (ORD). A Newark Polaris Lounge should be opening by the middle of this year, along with one in San Francisco. United is planning to open a total of nine Polaris Lounges around the world, with Dulles and Los Angeles following later in 2017, and Hong Kong, London and Tokyo, which are all expected to open by the end of 2017. Polaris Lounges are only accessible to business- and first-class passengers flying United Polaris or business or first class on Star Alliance partners. Club memberships and elite status won’t help you here — United Club members, Star Alliance Gold Members, Global Services members, etc., can only get in if they’re flying business or first class. 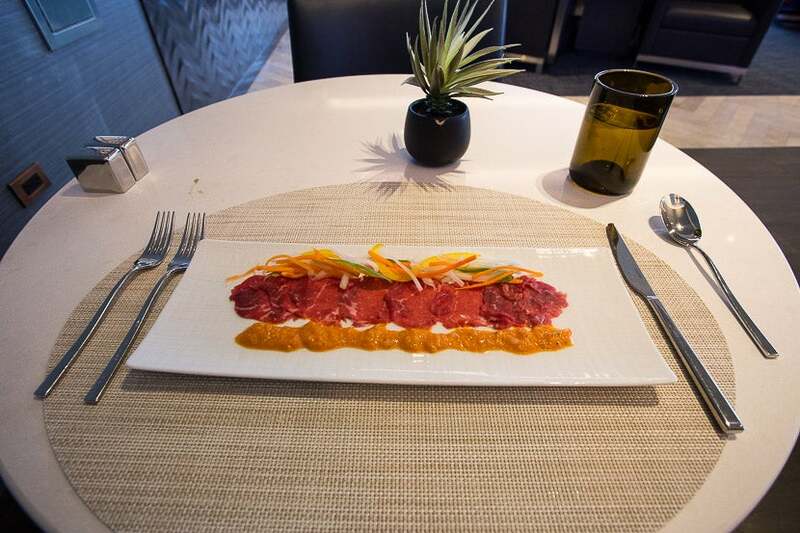 Have you had a chance to dine at Chicago’s Polaris Lounge?